Transport yourself to a fragrant orchard in mid-summer with this mouth-watering blend of peach, ginger and rare white tea. White tea has a delicate, honey-like flavor and contains the highest antioxidant level of all teas. 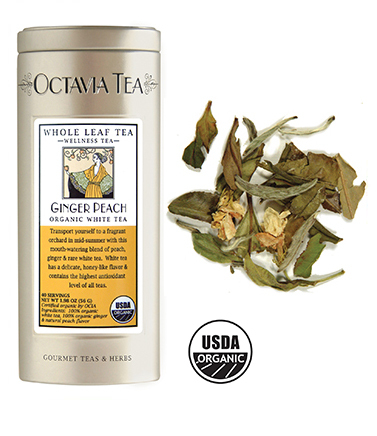 Our Ginger Peach white tea was a finalist at the World Tea Championships and is one of our best sellers! I absolutely love the combination of peach and ginger. The peppery heat from ginger pairs so well with the sweet and juicy flavor of a peach. I really like the contrast of flavors. So I was very excited to try this Ginger Peach tea from Octavia. While white tea is rather delicate in flavor, here it works well. It is a soft-tasting tea, but it has a natural honey-like sweetness that complements the ginger flavor very well. And even though it is soft, it is not so delicate that it is indistinguishable. I can definitely taste the sweet, fresh qualities of the white tea in my cup. The ginger is the strongest flavor of the cup. It offers a pleasant peppery kick – but it is a gentle, swift kick and doesn’t knock me over with its flavor. It is a very pleasing contrast to the lusciously sweet fruit flavor. It tastes just like a fresh, ripe peach! YUM! This is a tea that can be relaxing if served hot, or rejuvenating when served iced… and it is absolutely delicious whichever way you choose to serve it. I like mine with just a tiny drizzle of honey in it (I prefer raw, locally harvested honey) to highlight the honey-esque notes of the white tea just a little. This is also a tea that should be kept on hand at all times – as good medicine! It is especially soothing to a sore throat or an upset stomach, and it has a mild enough flavor that kids as well as adults can enjoy it. And, here’s another bonus: It’s organic – another reason to feel really good about this tea.